Former Sen. Joe Lieberman (I., Conn.) is reportedly no longer being considered to replace James Comey as FBI director. The White House is still searching for Comey's replacement but has moved on from Lieberman, CBS News reported Wednesday, citing a source familiar with the matter. Lieberman had been considered a frontrunner for the FBI's top job, but President Trump now wants to see a broader range of candidates for the position, according to CNN. While Trump was reportedly intrigued by the idea of Lieberman replacing Comey, others inside the White House thought he was not the right choice, in part because of his lack of experience with the FBI or as a federal prosecutor. Some critics have said a politician should not be the next FBI director after President Trump fired Comey earlier this month. 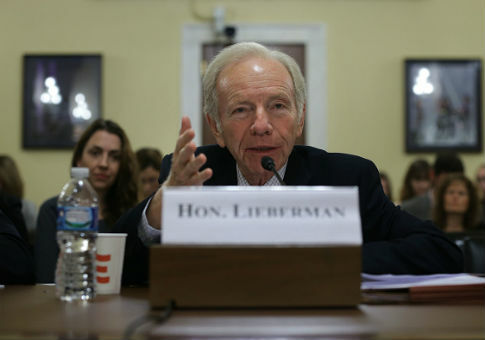 Trump's decision to retain attorney Marc Kasowitz as his outside counsel to help navigate the investigations into ties between the Trump campaign and Russia may have also hurt Lieberman's chances. Lieberman is an attorney at Kasowitz's firm, Kasowitz, Benson, Torres & Friedman in New York, the Washington Post reported. The Post said that Lieberman is still technically being considered for Comey's replacement but has "fallen from the top tier" of candidates. With Lieberman apparently out of the running, Trump is considering many other options for FBI director, according to CBS News. The president had also been considering Republican Oklahoma Governor Frank Keating, acting FBI Director Andrew McCabe, and former FBI official Richard McFeely. Other candidates have included former [Department of Justice] official Alice Fisher; Adam Lee, special agent in charge of FBI Richmond; New York State Judge Michael Garcia, Federal Judge Henry Hudson, former Homeland Security Adviser Fran Townsend, and Mike Rogers, former chairman of the House Intelligence Committee. This entry was posted in National Security and tagged FBI, James Comey, Joe Lieberman, President Trump. Bookmark the permalink.